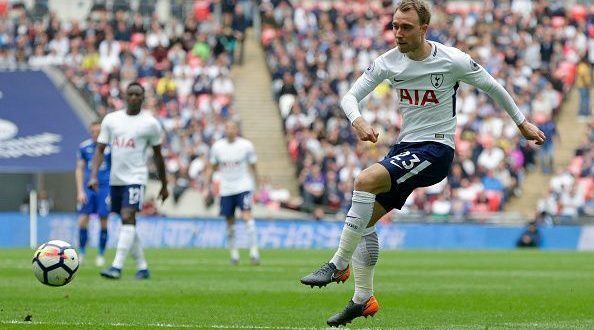 Davinson Sanchez, Christian Eriksen and Son Heung-Min scored the goals as Tottenham earned a 3-1 victory over Leicester, with Jamie Vardy missing a penalty for the visitors with his first touch before pulling a goal back. Still without Harry Kane and Dele Alli, Spurs boss Mauricio Pochettino once again turned to Fernando Llorente in attack, while the Leicester manager Claude Puel took the surprise decision to start with Vardy on the bench. This was Tottenham’s fourth victory in a row despite Kane’s absence and this run has allowed them open up a 10 point lead over fifth place Chelsea before their trip to Manchester City on Sunday. There was an early talking point as Son was booked for diving after he went down inside the box following a challenge by Harry Maguire. Leicester, who have beaten City at home and Chelsea away, while also taking points off Liverpool, impressed in the opening half an hour and with January signing Youri Tielemans showing some good touches on his debut. But they were behind on 33 minutes when Sanchez headed Eriksen’s cross past goalkeeper Kasper Schmeichel from just inside the six yard box. The game’s biggest talking point came on the hour mark when, with Vardy ready to come on, referee Michael Oliver awarded Leicester a penalty after Jan Vertonghenwas adjudged to have brought down James Maddison in the area. Maddison picked the ball up, ready to take the spot kick, but Puel immediately sent Vardy on in place of Demarai Gray to take the penalty, and Leicester’s top scorer saw his powerful effort saved by Hugo Lloris. 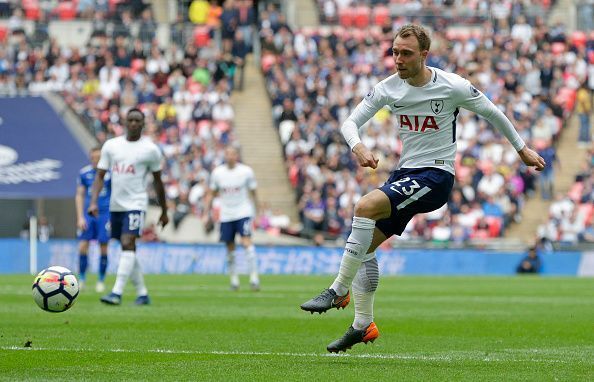 It proved a key moment as Eriksen doubled Tottenham’s lead just three minutes later as he picked up Llorente’s lay-off on the edge of the box and curled an inch-perfect effort into the corner past Schmeichel. Vardy did pull one back for Leicester on 76 minutes to make it 100 goals in senior football, but Son scored a breakaway third in stoppage time to make the result safe. The defeat means Puel’s men have now picked up just a single point from their past five games, with the pressure on the Frenchman increasing as they stay in 12th place. Manchester City moved back to the top of the Premier League after humiliating a stunned Chelsea 6-0 at the Etihad on Sunday.